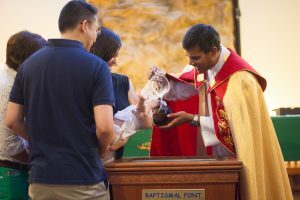 Holy Baptism is the basis of the whole Christian life, the gateway to life in the Spirit and the door which gives access to the other sacraments. 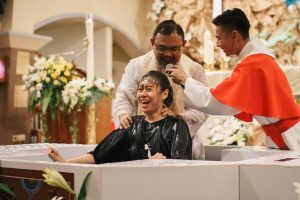 Through Baptism we are freed from sin and reborn as children of God; we become members of Christ, are incorporated into the Church and made sharers in her mission. Baptism is not only the first of the seven sacraments, it is also the basic sacrament.Why? Unless a person is baptized, none of the other six sacraments can be received. For instance, only a baptized person can receive Holy Communion. Christ Himself ordered His disciples to preach the Gospel to all nations and to baptize those who accept the message of the Gospel. "Very truly I tell you, no one can enter the kingdom of God unless they are born of water and the Spirit." (John 3:5) This sacrament is not a mere formality; it is the very mark of a Christian, because it brings us into new life in Christ. Parents are the child’s "first teachers or witnesses" in the ways of the faith. Having your child baptized endorses your agreement to take on the responsibilities of training him/her in the practice of the faith and bringing him/her up in the way of Christ. By the Godparent’s own faithful practice and involvement in the life of the child, he/she will help the child live a Christian life faithful to the baptismal promises. RCIA/Y stands for the Rite of Christian Initiation for Adults/Youths. As Jesus said “Come and See” in John 1:39, we warmly invite all inquirers and our separated brethren to come and join us in our journey to explore and deepen our faith. This journey prepares adults to receive the sacraments of Christian initiation (Baptism, Confirmation, Holy Eucharist). To fully understand the level of commitment as a Catholic, the RCIA/Y journey allows one to deepen their knowledge and clarify any doubts they may have before deciding to get baptised. The starts in June and the journey concludes with baptism being celebrated the following year at the Easter vigil. The year long journey is anchored by weekly sessions held on Tuesdays, from 8.00pm - 10pm, at the St. Francis Xavier room (Level 2, Parish Centre). 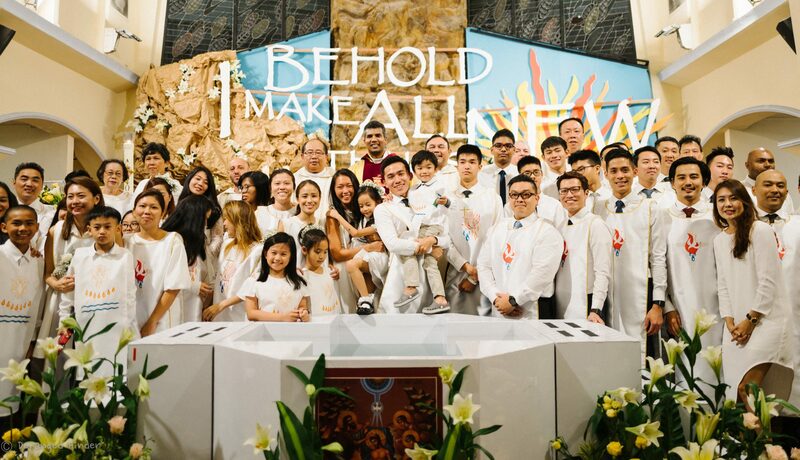 RCIA (Rite of Christian Initiation for Adults) sessions start in June and the journey concludes with baptism being celebrated the following year at the Easter vigil., every Tuesday from 8 - 10pm. Jesus invites everyone - both Inquirers and Companions are invited to come and see! RCIY (Rite of Christian Initiation for Youths) typically runs from after Easter to Easter vigil the following year, session is every Sunday from 10.15am to 12pm. This is for youths (between the ages of 13 to 23) who are interested in learning more about the Catholic faith or baptised youth who have not received the Sacrament of Confirmation due to exceptional circumstances. Parental consent is required for youths below 21 years old. A “Come and See” information session is usually held just before a journey officially begins. Attendance of Parents & Godparents are COMPULSORY at both spiritual preparation and the baptism itself. To receive the Sacrament of Baptism, print and fill in the most suitable form. and pass the hardcopy to the Parish office or email the filled up form to rciy@sfxchurch.sg or rcia@sfxchurch.sg. The ministry will follow up with you accordingly. Registration is open from Easter to June, with the sessions beginning in June. Wish to help out in the ministry?